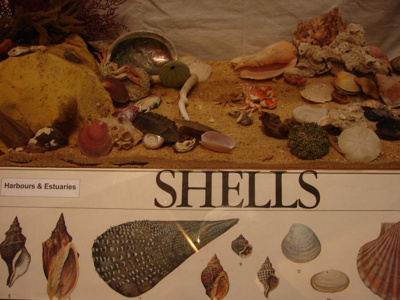 A large collection of shells from the local area, displayed in a glass topped display case, with twelve drawers each containing assorted shells and sea creatures. The display was researched and mounted by our local U3A (University of the third age) study group. A job that took them many months and is a credit to them. It is proving to be a popular exhibit with both young and old, locals and tourists.